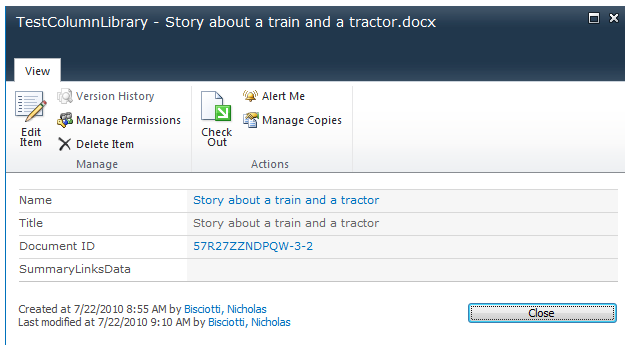 In SharePoint, there is a column type called, "Summary Links Data." Microsoft desribes this column type as "Columns that represent summary links for a page. Summary Links include a title, description, image, and URL and are used on publishing pages to present grouped links by using a set of shared styles" (Microsoft, 2010). This column type is brilliant in theory, but unfortunately they don't appear to work as expected. Here is my assessment of the Summary Links Data column type. 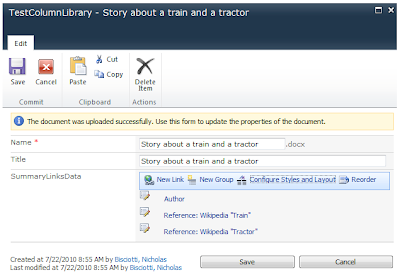 In SharePoint 2010, if I add a Summary Links Data column to document library, then add a new document, the new or edit document properties page looks correct. The Summary Links Data column is represented by an editable summary links control. However, after the links have been added and the document uploaded, you return to the document properties using the "View Properties" page. The result of this is that the links are not visible. Huh? Microsoft (2010). Create a site column. Retrieved July 22, 2010 from http://office.microsoft.com/en-us/sharepoint-server-help/create-a-site-column-HA010177759.aspx. Does anybody has experiece using it?